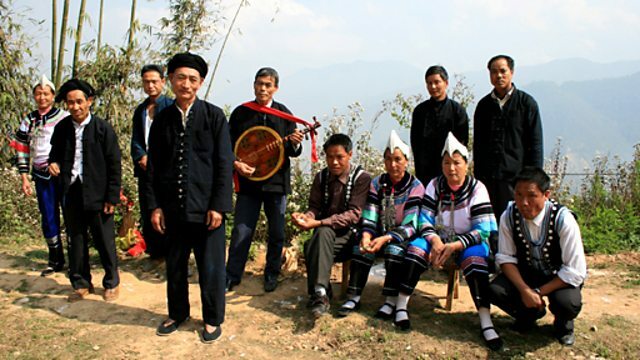 Lucy Duran explores the music of three of China's 56 different ethnic groups, focusing on muqam, performed by Xinjian Province's Uyghur people. In the second of two special programmes recorded on location in China, Lucy Duran explores the music of three of the country's 56 different ethnic groups. She visits Xinjiang, China's largest province that makes up one-sixth of the country's land-mass. On the ancient Silk Route, it is also home to the Muslim Uyghur people who perform muqam, a type of music that can be found all over the region from Azerbaijan in the west to China in the east. The market in Kashgar, Xinjiang. Lucy Duran is in the livestock market in Kashgar, Xinjiang. Xinjiang and the Uyghur people. Lucy tells us more about the Xinjiang and the Uyghur people. Lucy is on the silk road, the Kashgar – Islamabad Highway. Lucy hears a form of music unique to this area - a drumming group. Music from the Shache area. Lucy hears musicians from the Shache area of Xinjiang. Musicians from the Shache area. Lucy hears musicians from the Shache area of Xinjiang, playing extracts from a suite. Lucy is with Professor Zhou Ji, an expert in Uyghur Muqam music. Lucy describes the buildings and area of Xinjiang. Lucy listens to Dolan musicians performing a Muqam. Lucy reflects of the Uyghur music and tradition she has heard.